The Philippine Advocacy Through Arts and Culture?s (PATAC) youth committee wrapped up its ?Filipino? Huh?? 2008 essay contest with a simple and intimate dinner award ceremony on December 12, 2008 at one of the known Filipino owned restaurants, Mayette?s Fine Foods on Danforth Avenue in Toronto. The Filipino? Huh? essay contest launched early this year aimed to: engage young people of Filipino descent in identifying and articulating the challenges they face as visible youth minority in relation to their immigration, settlement and development as young Filipinos in Canada; get their insight on how to best deal with these issues; consolidate their perspective and anecdotal experiences and compile it into a literary work; enhance their writing skills; and, promote the youth of Filipino descent as a literary artist. The essay contest winners are as follows: In the 13-18-year-old category - first prize, Loreto Paras Sulit Award - Sandra Dimaano; second prize - Chloe Lopez. In the 19-24-year-old recent immigrant category: first prize, Alejandra Cabanela Tsang Award - Angie Torres; second prize - Lemarc Alonzo. In the 19-24-year-old Canadian born/raised category: first prize, Antonio Zumel Award - Scott Ramirez; second prize - Laurice Macaraeg. Alejandra Cabanela Tsang embodied every Filipina mother?s image, sacrificing and inspiring. She brought up her children with good Filipino values and pride. In the words of her own son, Dr. Theo Tsang, ?She instilled in us (my sister and I) Filipino values such as respect of elders, perseverance, being hospitable and the importance of having a good education. She always reminded us never to forget who we are and where we came from.? Loreto Paras Sulit personified the accomplished and progressive Filipino woman ? a great pioneer of Philippine English Literature, as novelist Juan Laya said of her in 1951. She is well known for her English short stories. She is also a mother, a teacher, an organizer and a social worker. She co-founded the University of the Philippines Writers Club in 1927, taught in Torres High School and was secretary-general of the Philippine Red Cross for several decades. She passed away at the age of 99 on April 2008. Antonio Zumel exemplified the Filipino journalist and writer. He took the side of the oppressed masses and dedicated his life to fighting for a truly free, sovereign and democratic Philippines. Writer, unionist and later leader of the revolutionary underground, he wielded the pen as a mighty weapon in the quest for justice and an enduring peace. He experienced, as many of our compatriots have, the loneliness of living in a distant land, all the while immersed in the collective fight for what he believed in. The ceremony was graced by the family of late Loreto Paras Sulit. 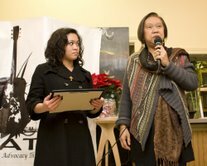 Elsa Sulit, the daughter of Loreto Paras Sulit, presented the award named after her late mother. Emceed by Belinda Corpuz, PATAC?s vice president for youth affairs, the evening?s program was enriched by performances from Scott Ramirez a.k.a. R.Scribe (spoken word); Mary Auxi Guiao (singer/songwriter); Panyolito; Benson and Isabella Corpuz (duet). As with any PATAC project, the endeavour was completed because the local community contributed to its success. Among the judges were writers, journalists and educators from the Philippines and greater Toronto: Hermie Garcia, seasoned journalist and writer, Ontario Lt. Governor-general awardee, publisher and editor-in-chief of the multi-awarded local newspaper, The Philippine Reporter; Mila Garcia, editor of two books, Filipina I and Filipina II, co-publisher and managing editor of The Philippine Reporter, researcher and well-known community activist; Ramon O. Grajo, sessional instructor and PhD student in Philosophy at the University of Toronto; Ricky Esguerra, former instructor at the University of the Philippines in Political Science and current vice-president for education of the Community Alliance for Social Justice; Karlo Cabrera, Instructional Leader, Equity (North East)-Toronto District School Board and co-chair of the 2008 Joint Asian Heritage Month celebration of the Toronto Catholic and Toronto District School Board. First prize sponsors: Dentistry at Main Street (Dr. Tsang) for the Alejandra Cabanela Tsang Literary Award; Elsa Sulit and family in memory of Loreto Paras Sulit; Santaginians Association of Ontario, Inc., Jojo Geronimo, Marco Luciano and Cynthia Palmaria, Ben and Paulina Corpuz, Levy Abad Jr., Mon Grajo and Elena Balisi-Grajo, Ricky Mendoza, Gillian Bradley, Frances Martinez, and Alma Bravo-Perez for the Antonio Zumel Award. Supporters and partners: The Philippine Reporter, Balita, Jojo Taduran, Marlou Tiro, Jason Bagni and Kim Villafuerte of Trip - Mabuhay Radio, Kapisanan Philippine Centre for Arts and Culture, Migrante Ontario, and Community Alliance for Social Justice.